Explosive action and witty dialogue keep 2 Guns from being just another clichéd summer blockbuster. 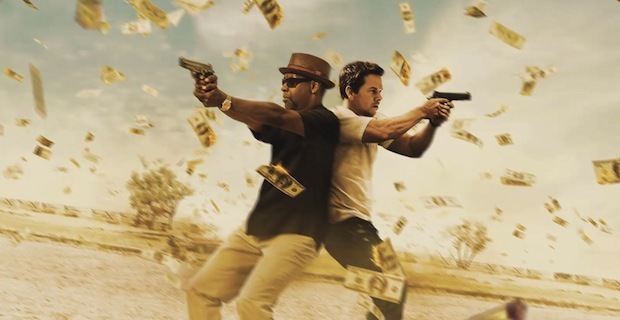 2 Guns centers around two men who are both (unknown to each other) undercover agents of different agencies who soon find themselves in a whole mess of trouble when a bank robbery goes bad. Now on the run from the law, Stig (Mark Wahlberg) and Bobby (Denzel Washington) must uncover a shadowy conspiracy in the most action packed way they can. Loaded with bullets and explosions 2 Guns is the cure for the summer blockbuster. No 3D gimmicks, no giant monsters, no superheroes, this film is straight ahead high octane fun with plenty of laughs. The best thing that 2 Guns has going for it is its star power. Washington and Wahlberg are hilarious together (why has no one paired them before? ), and even when the action slows down, their back and forth keeps you entertained. The thing you won’t see from the previews, however, is the other big names attached to this movie. The main antagonist is played by Bill Paxton and he does a stellar job at creating a memorable villain. Calm and snide, his character is the perfect mastermind behind all the double dealings and secrecy. Rounding out the cast is James Marsden as a cocky and corrupt government man and Edward James Olmos as the Mexican cartel boss. 2 Guns only real flaw was that it seemed a bit longer than it should have been. A few times throughout the film I found myself wondering why certain scenes and situations drug out as long as they did. A 90 minute run time opposed to a 109 minute run time seems more appropriate for an action movie, it keeps the pacing fast. The plot may have a lot of twists and turns, but it still could have told the same story with just as much precision and fun without the extra fluff. If you are looking for a fun movie for a night out that won’t disappoint, look no further; 2 Guns has you covered. It has enough action and comedy to make it worth your $10, and with Wahlberg and Washington starring, you might even be able to convince your girlfriend to go. This movie has a little something for everyone (except the kids), so do not miss it.